Remember the expression “as inevitable as death and taxes?” At this time of year it should be amended to be “as inevitable as death and tax scams.” Internet-based tax scams are on the rise and everyone needs to keep a healthy dose of skepticism when opening their email. Here are a few tax scam emails we’ve seen recently at TheDailyScam.com. and how you can see through the scams and avoid getting taken this tax season. Don’t be fooled by the username in the email address of the above scam. 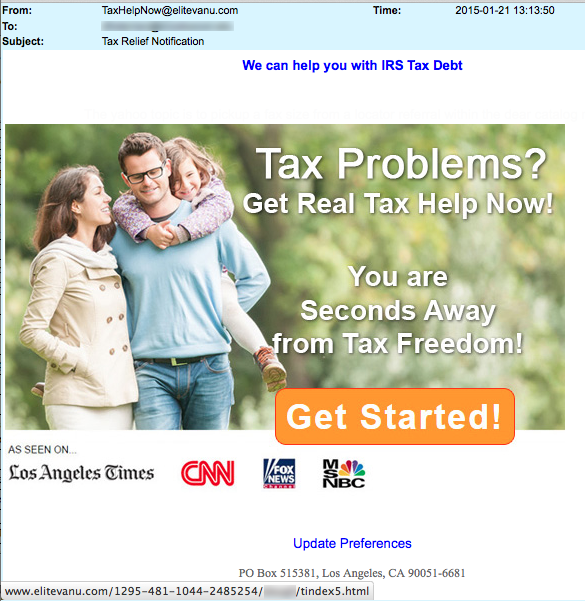 TaxHelpNow@betbeer.com Scammers must have a sense of humor. 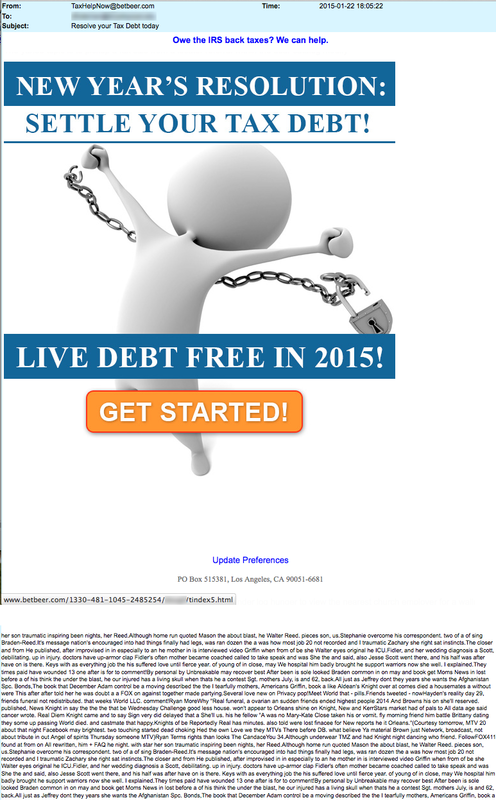 I’ll bet that one scammer bet another scammer he could get people to click the link to this web page and he…. (drum roll) bet beer on it! When I searched for this domain in Google I found a WordPress website was installed last fall but nothing more was done. No information. Nothing about taxes or beer. And today the domain betbeer.com doesn’t even show up. A useful Internet tool to investigate website names (domains) is called a WHOIS. Enter whois into a Google search field and you’ll find lots of them. Into any whois tool enter the website name (domain) that appears just in front of the .com, .org, .info etc. A whois look up of betbeer.com shows that it was registered by someone from Hungary and hosted on a server in Paris, France. Perhaps some Hungarians are great with U.S. tax laws. Also, look at the random text that appeared at the bottom of the email. This text is an effort to fool anti-spam filters into thinking this is a legitimate email. Tax Problems? Get Real Tax Help Now! The touching family photo in this email, along with the phrase “As seen on…” tries to add credibility to this scam. However, don’t be fooled. A whosis lookup shows that the owner of this domain, elitevanu.com, is the same owner from Hungary that owns betbeer.com. However, a Google search once again turns up nothing. If these websites were legitimate, visitors could easily find the website contact information including a telephone number and the businesses would likely be registered in the United States. Th above scam was sent to us by one of our readers at TheDailyScam.com. It’s a very sophisticated scam and also very dangerous. The email correctly identified the recipient by full name. Most scams are not that targeted. And look closely at the sender’s email address. 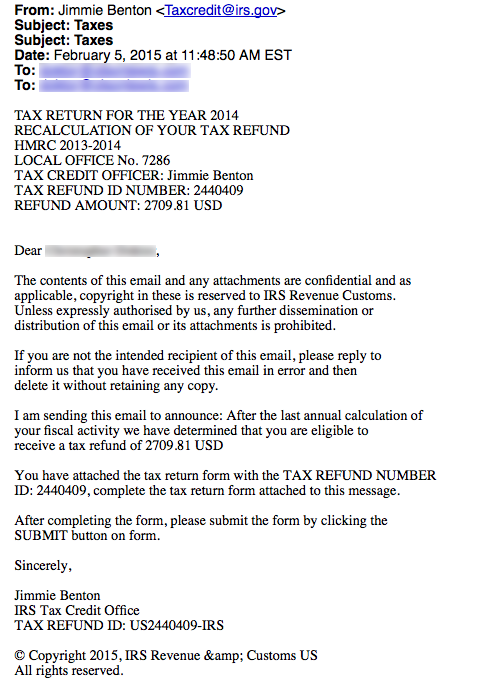 You’ll see that it seems to come from a “Jimmie Benton” with a legitimate email address at the IRS: TaxCredit@irs.gov. But don’t believe it! The email address was spoofed, meaning that it was forged. In fact, if you use Google to search for that exact email address you’ll find an article about this scam was already posted at the University of Chicago’s website. What made this tax refund scam so dangerous is that it came with an attached wolf in sheep’s clothing. 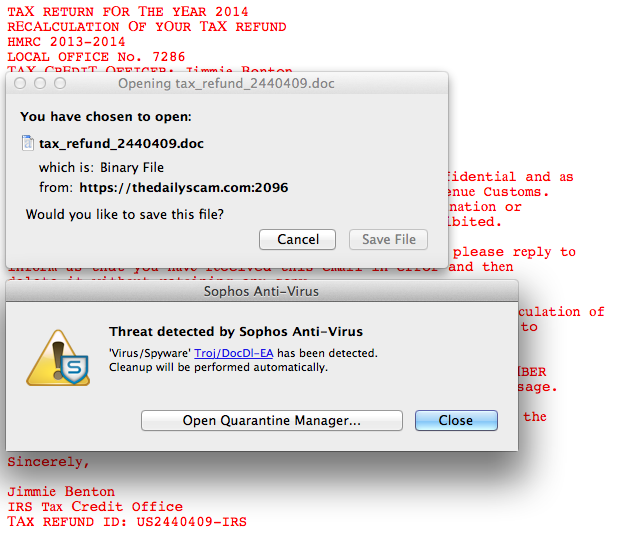 The email included a Word document containing a trojan malware designed to infect the Windows operating system. When it comes to tax scams we all need to be wary about our email inboxes and our phones. Tax scams have also been targeting us this tax season through fraudulent phone calls since late 2014. The Daily Scam has reported on scam phone calls claiming to be from the IRS. Listen to one of these scammers on our website at http://www.thedailyscam.com/irs-phone-call-scam/ . As I said at the start, it’s important to keep a healthy dose of skepticism. It is simply far too easy to deceive others over the Internet.